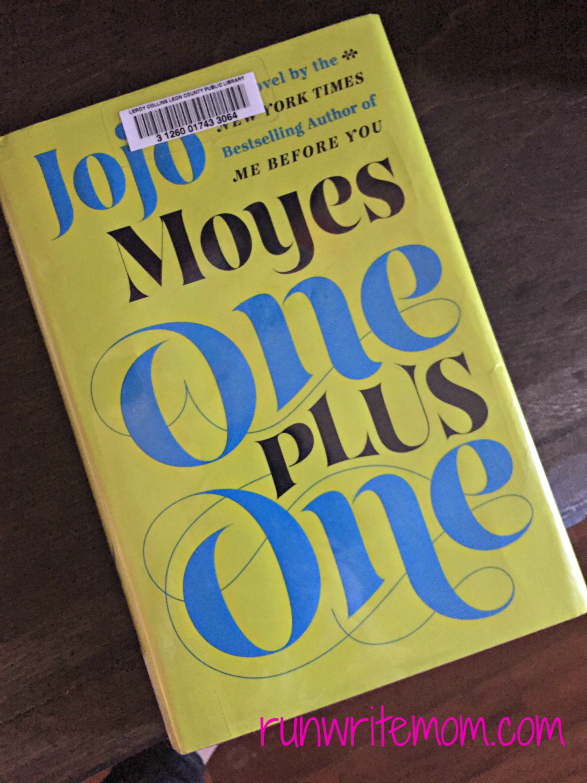 My first experience with author Jojo Moyes was reading Me Before You, a book club pick. While I did like Me Before You, it left...I don't know, I'm trying to write this with two children driving me absolutely insane. One of which is hanging on my arm and crying, "mama! my cup! my cup!" Even though when I gave him his cup all he did was throw it. Anyway, I'm glad she decided to do a sequel to Me Before You (titled After You) but I haven't read it yet, so don't spoil it for me. When does the Me Before You movie come out? June, okay. Me Before You wasn't a book that I would guess I would like from the description but I ended up liking it, so when I was One Plus One, I decided to give it a chance too. The description actually sounded good on this one. 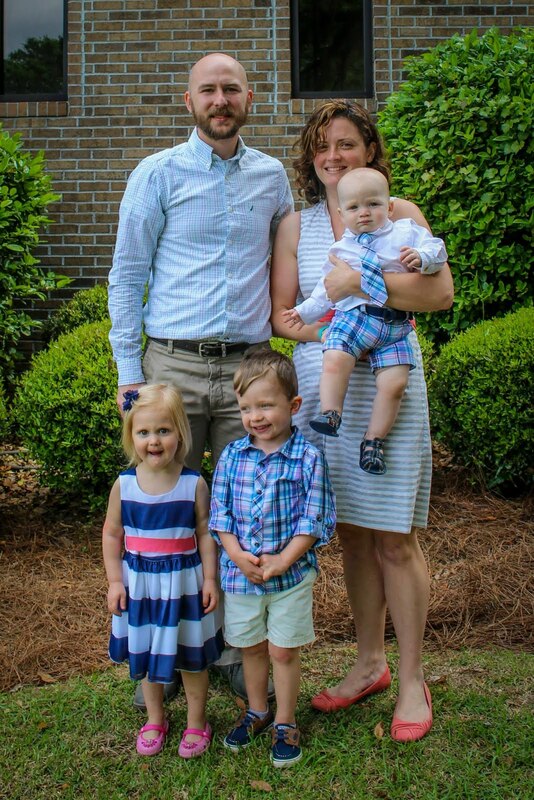 In One Plus One, we take a road trip with a down and out single mother, her two kids, their dog, and the stranger who agrees to drive them to get away from his own problems. The mom, Jess, is a trusting optimist to a fault, and needs this trip to get her daughter into a gifted school. Completely out of character, Jess steals, just once, to make ends meet and make the trip. But who is it that ends up offering her family a ride? None other than the millionaire businessman she stole from, who is clueless to her misdeeds, and has made some poor decisions of his own. 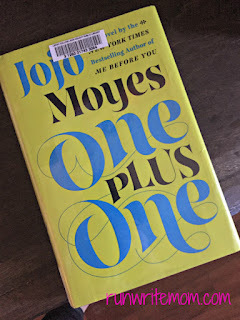 Jojo Moyes' novel is a love story, but is in no way typical of the genre. It is well written and has plenty of twists and turns to keep you reading. One Plus One is full of quirky characters, from Ed and Jess themselves, to her maths obsessed daughter and misfit, eyeliner wearing stepson, and even her deadbeat ex. You really feel like you're getting to know them all while you take this road trip together. While in the end, everything gets straightened out, it's the journey that really matters. Ah, nice sappy cliche for you there. Each character learns something from another and most of them teach something as well. Jess learns to be more practical, while Ed learns to look on the bright side and not take the things he has for granted. Don't worry though, the book isn't all about learning something, it's a nice intriguing story about two interesting people from completely different walks of life joining forces to save the world. Oh wait, no, just to save their families, I guess. There was one thing I didn't like about the book, however. Jess. Jess is what I didn't like. Supposedly she's an optimist, an honest person. Yet, after she does the out-of-character thing and steals to help her family, she goes on to be rude to the person she's stolen from, after he offers to give them a ride across the country! What is up with that?! PMS? Maybe she's mad at herself and is putting up a wall so she won't make a connection with him and therefore feel even more guilty? I don't know. What I do know is that it doesn't make sense. I guess we'll see if they handle it any differently in the movie. Yep, One Plus One has been optioned for a movie as well.